Reminder: Monday is a Holiday. 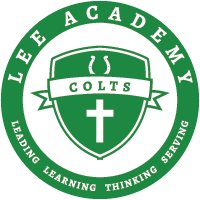 Lee Academy & The Colt Cradle will be closed. Classes will resume on Tuesday. Team and individual basketball pictures will be taken Tuesday 1/17 at 2:00. Forms will be given out today, and they must be brought back Tuesday. Students in grades 10-12 interested in attending a DSU Day February 1, see Mrs. Antici for information. Seniors- See Mrs. Antici about Scholarship information. There will be a sign up sheet in the office for anyone interested in playing tennis and those who plan to try out for Jr. High and High School Cheerleader. If you have any questions about the Cheer Clinic at Lee Academy, please contact Caroline Kincade at 662-902-9988. Don't forget to call Caroline to reserve your spot by Monday, January 16th! !